Jurassic World has been the kind of critical and financial success that pushes studios towards making sequels. Unfortunately, Jurassic World doesn’t naturally lend itself to a sequel without losing the key ingredient that makes this and the very first movie such a success – the theme park. It isn’t the dinosaurs, the action, the horror or even the actors/characters. The reason people love Jurassic Park and then have loved Jurassic World is because they both follow the same basic pattern – amazing dinosaur themed park where the attractions break-out and kill people. Jurassic World is copying the premise of Jurassic Park but it doesn’t matter because it is just different enough, with enough call-backs to the original, to make it work. This leaves Universal with a major problem though. Biggest opening weekend in history is not something that can be ignored but making sequels to Jurassic Park is problematic. The original sequels couldn’t capture the magic and the one aspect they missed was the theme park. It isn’t enough to have dinosaurs chasing people if we don’t have the original “wow” that amazed us in the first place. Except this isn’t different enough. Once you have broken the dinosaurs out of the cages, there is no threat or danger to build towards. 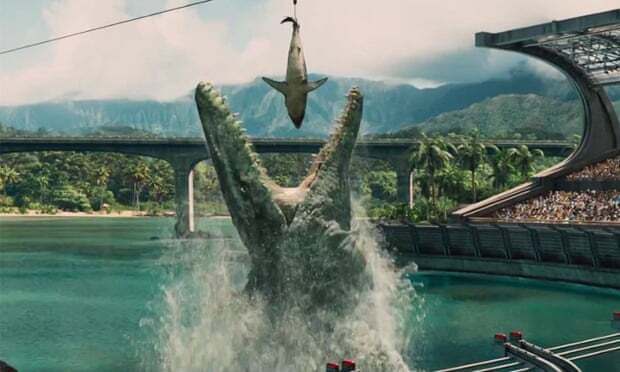 It was great seeing the Mosasaur jump and eat a great white shark – it was cooler when it attacked again later in the movie. If the dinosaurs are already loose, where is the suspense? What is the “wow?” How is it different? The second option is to follow the thread that was dangled in the first movie. InGen and Dr Wu took samples of dino-DNA to create weapons. You could have Chris Pratt (because…) and a group of concerned folk who then follow the InGen villains to retrieve and stop the dinosaur soldiers. Here we could have new dinosaurs mixed with old – as InGen have been creative, splicing and developing unstoppable dinosaurs. The setting would also change – from Park or Jungle to laboratory. The problem with this idea – it sounds awful! It isn’t Jurassic Park. It would feel like a cheap video game cash-in and would lose the magic and basic elements that make Jurassic Park movies what they are. Dinosaur as soldier worked well when it was hinted at and played with – not when it is the central idea for the whole movie! There is of course a third option – no sequel! Leave Jurassic Park and the franchise as a whole alone. Jurassic World is the decent, logical conclusion to the story. They tried dinosaur themed park twice and twice it failed. They tried creating new dinosaurs and it failed. There is only so many times you can repeat the same, bad idea before you stretch credibility too far. This won’t be listened to though. No way will a studio have a record-breaking movie that seems to lend itself to a franchise and leave it alone. I just won’t be looking forward to the inevitable sequel. Overall, Jurassic World was like capturing lightning in a bottle. There is no way that bringing back a dying franchise with such confidence and success will work again. Not to mention that the story itself doesn’t actually have a natural extension for a sequel. Unfortunately, there is no way the studio will ignore the money so let’s get ready for Jurassic World: The Lost World! I’m definitely in teh no sequel camp. The sequels last time didn’t really work out, did they? And even World is not as great as Park, so what’s the point? Let’s let it sleep. Exactly! Can’t see it happening though! I want a sequel because I really didn’t like World one bit, but you’re right that the core concept is now pretty strained. Maybe someone else could be crazy enough to open another park, like a rich billionaire in Dubai or something. Its a shame you didn’t enjoy this version because I can’t see them ever being able to get as close to the original as they did with this! Argh! That would drive me crazy. Regardless, I know I’d be there on opening night!